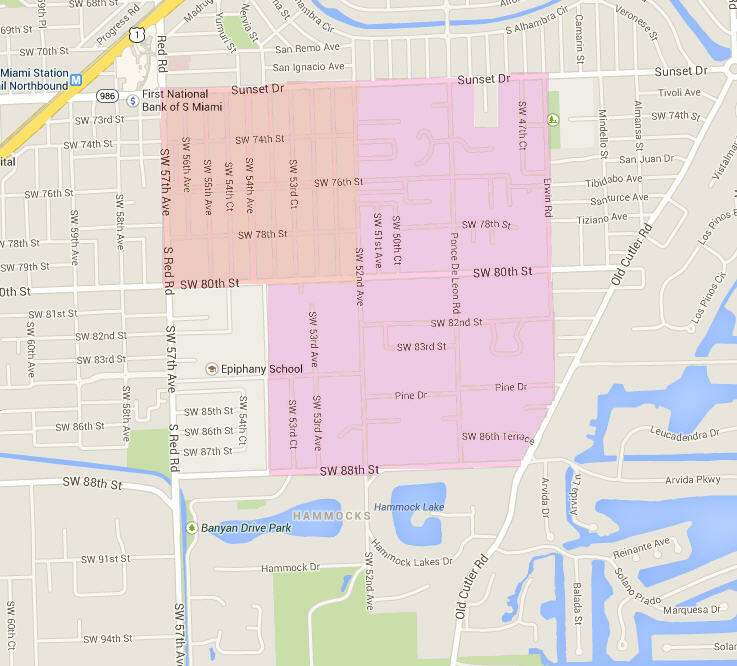 High Pines (area in orange) and Ponce-Davis (area in pink), located between Coral Gables and South Miami, is a neighborhood of high demand and short supply. These areas not located within the city limits of South Miami or Coral Gables, but rather a square mile of unincorporated Miami-Dade County. High Pines is a well established neighborhood with most lots not exceeding 15,000 square feet. Housing ranges from mid-century to brand new construction with prices ranging from $400,000 to over $2,000,000. Housing options in this area range from luxury homes to townhouses and condominiums. Ponce-Davis is an unincorporated exclusive community in Miami, bordering High Pines on the west, Coral Gables on the north and south, and Old Cutler Road on the east. Ponce-Davis homes are situated on large lots as compared to Coral Gables’ lots with some being at least one acre ranging between $2,000,000 to $4,000,000. Although Ponce-Davis is a non-waterfront community, residents have large back yards and some with grand pools and gardens. These neighborhoods are very family oriented. Some of the schools designated for this area are controlled choice schools which include Sunset Elementary, Coral Gables Preparatory Academy, and George Washington Carver Elementary. Controlled choice allows school districts to make student school assignments using parents’ indicated favored school choice. Should a student not be placed at the favored school, they will be placed on a waiting list. Coral Gables Preparatory Academy, an A-rated historic public school in the Gables, includes grades Pre-K through 8th grade.The other schools that are designated for this area include Ponce De Leon Middle School as well as Coral Gables Senior High. High Pines and Ponce-Davis are walking distance to many of the shops and dining located in South Miami, such as Sunset Mall, a grand outdoor mall featuring shops, movies, dining, and entertainment for everyone. The communities are ideal to live in for the growing family and anyone who enjoys a quaint neighborhood and access to much of what South Miami and The Gables has to offer. Luxury living is in demand and both High Pines and Ponce/Davis are greatly desirable places to live, work and play. If you have any interest living in High Pines or Ponce-Davis, contact us and we will assist you with your real estate needs.